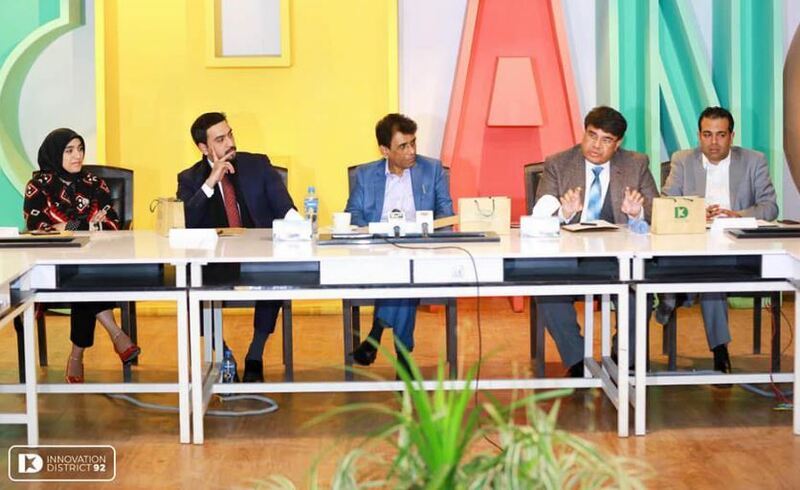 Federal Minister IT & Telecom Dr. Khalid Maqbool Siddique and his team sat down with Pakistan’s tech industry for a one hour long candid conversation on 22nd January 2019. 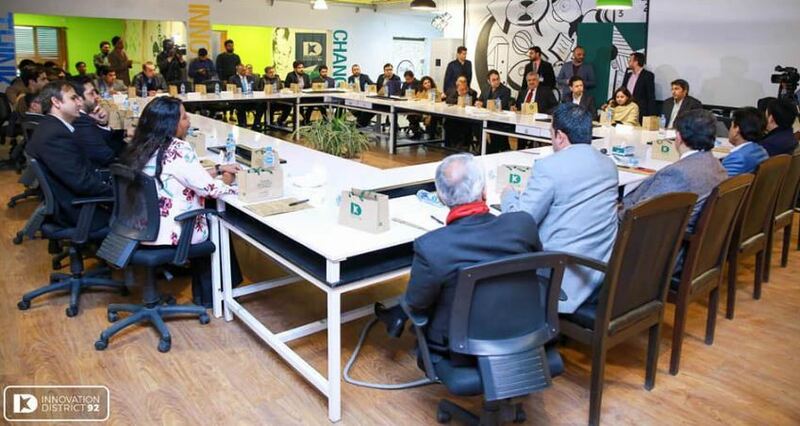 The delegation was hosted by Innovation District 92, a startup incubator focused on flourishing the entrepreneurial ecosystem of Pakistan. The purpose of the Meetup was to listen to the problems, and difficulties faced by the tech industry, not to criticize the government but to communicate how to improve them. The attendees consisted of CEOs of well established companies and innovative startups just beginning their journey. Some prominent members were Monis Rehman from Rozee.pk, S. M. Imran from Din Group, Suneel Munj from Pakwheels, Qaiser Ansari from Pantera Energy, Alicia Dean from City of Austin, Hasnain Sheikh from Inov8, Umar Rana from Alchemative, Sana Mela from Perspective, Jamil Goheer from Kualitatem, Zafar Khan from Sofizar, Aqsa Tariq from IDG, Badar Khushnood from Bramerz, Haris Naseer from Infotech among others. The conference was opened by Umar Farooq explaining the purpose of the conference and how the honorable IT Minister wanted to listen to the concerns directly from the Tech industry. Nabeel Qadeer, who was leading the conference, highlighted the importance of focusing on the suggestions to help improve the industry. M. Imran, Din Industries, explained how we need to focus on innovative companies to take Pakistan forward. He spoke about how tech is multiplying at a faster rate than traditional industries such as textile. Umar Rana, CEO Alchemative, discussed how he operates his business outside of Pakistan and noticed that foreigners are not aware of the potential of Pakistani firms. Badar Khushnood, Co-Founder Bramerz, added to this by talking about how the government needs to focus on visa facilitation. Haris Naseer, Infotech, pointed out that the barriers to entry need to be reduced. Alicia Dean, Founder ATX+PAK, a business development program to Austin, spoke about ATX being a gateway to the US through which the best and brightest startups of Pakistan will be highlighted in the US. Innovation District 92 is the official in country partner for ATX+PAK Advance program. Jamil Goheer, Founder Kualitatem, talked about how our focus needs to be on improving marketing and sales of tech products and government should facilitate in that. Sannan Khan, CEO Foster Learning, commented on also including the remote and rural areas in this conversation by improving the tech availability and Sana Mela highlighted the fact that there needs to be a research center set up by the government that constitutes data on impact and numbers of tech industry which can then be quoted to international market. Dr. Sumaira Rehman then steered the conversation to the academic inadequacies that could be eliminated through the tech industry starting from improving HEC policies. Aqsa Tariq, IDG Pakistan, pointed out that Pakistan does not have an official blending learning policy. There is a lack in local research and there are limited IT firms and IT services. Dr. Nadeem, Superior University, suggested that all universities are producing the same type of IT graduates. He said that HEC should include new courses in the curriculum such as Data Science. Moreover, he suggested to give projects to university students or create research centers that would help improve Pakistan’s academia. Dr. Shahab Imam replied to the queries by ensuring the attendees that the FBR and IT Ministry are working tirelessly to iron out the chinks in the industry. Dr. Khalid Maqbool then spoke how it is good to hear the suggestions given to him by the attendees. He ensured them that the government is taking note and developing policies that will fix these issues.